Seeing EQUiSat isn’t quite as easy as just looking up while it’s passing overhead. The satellite’s four LEDs are only on one face of the satellite, and the satellite is slowly rotating. There can also be periods of time where the satellite isn’t flashing at all. However, this makes it that much more exciting to search for EQUiSat! 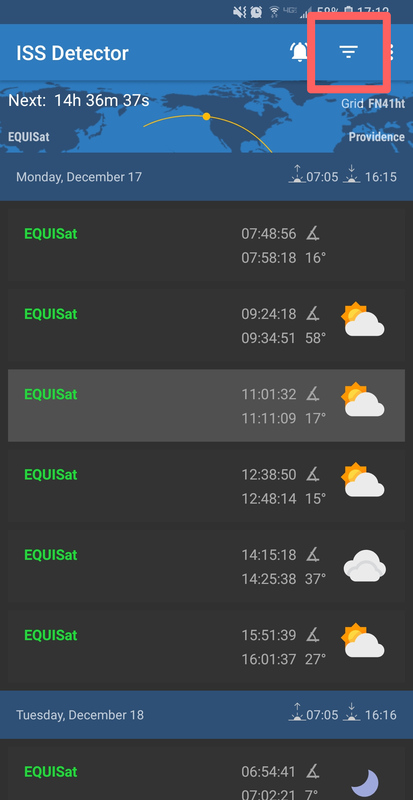 Download an app to show you where to look for EQUiSat in the sky. We recommend the ISS Detector app for Android and iOS or Orbitrack for iOS. Check whether EQUiSat is currently in “IDLE FLASH” mode or its LiFePO4 batteries are close to full (see below) using our website or our Twitter bot. Text notifications, which you can subscribe to using our app! Choose the pass with the highest “max elevation” or “max altitude” you can find that’s still in the dark; these are the ones where the satellite is highest in the sky (and closest to you) so you’ll be most likely to see it. Keep in mind that some passes may be blocked by buildings, etc. near you. 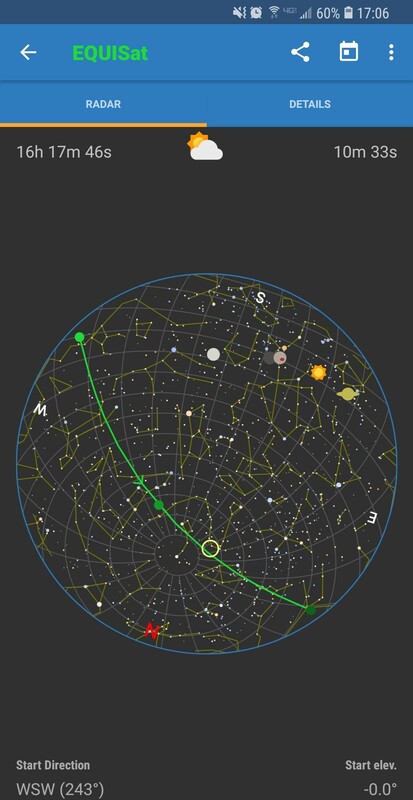 Learn how to use your app to see where EQUiSat is in the sky (see below for information). You won’t want to be learning during the pass! See the animation below to know what kind of flash you’re looking for! (Optional) read up on tips here or here for improving and managing your night vision before going outside. The earlier you start adjusting your eyes the better you’ll be able to see! There are also tips for how to look for something bright in the dark. Several minutes before the pass starts, head outside to a dark place with a clear view of the sky (the top of a building or hill is great), turn down your phone’s brightness, turn on the “night mode” in your app if it has one, and get rid of as much light as you can, to help your eyes adjust. As the satellite passes over you, spend most of your time staring about 10-20 degrees to the side of the point in the sky where the satellite should be, taking very quick glances at your phone to figure out where that is. The reason you shouldn’t look directly at the satellite is that the “cone” cells in the middle of your eye are less effective in the dark, while the “rod” cells on the fringes are better. Try to stare at a star and you should experience this (see here for more). Submit a report of your sighting (even if you weren’t sure you saw it) to our form! When it’s set to flash, EQUiSat performs a “flash burst” every minute. During a burst it flashes three times for a tenth of a second, with each flash one second apart (see the animation). Tip for those with a HAM radio: the flashes generally occur just before or after the satellite’s transmission, so you may be able to predict a flash based on those! The satellite in normal operation will switch between two states: “IDLE FLASH” and “IDLE NO FLASH.” During IDLE NO FLASH, the satellite will work on charging its LiFePO4 batteries. Once they’re almost full, it will switch to IDLE FLASH and will keep flashing until the batteries get low and it switches back. It tends to flash for several hours before needing to recharge over the course of about a week. Keep an eye on equisat.brownspace.org/data and our Twitter bot to get the latest “state” of the satellite! The timing of EQUiSat's flash burst. The bursts occur every minute when the satellite is in IDLE FLASH mode. This is the hard part; to see EQUiSat you’ll need to know what part of the sky to watch (if you look outside at night, there will probably be at least 5 blinking things in the sky). EQUiSat will move across the sky about as fast as an airplane, and you want to be staring at where it will be so you’ll see the quick burst of flashes when they happen. There are several ways to tell where it is in the sky, but the best is to use an app on your phone that shows you how to point your phone towards where EQUiSat is. That way, you can line up your phone in the right direction and look where it points! Brown Space Engineering is working on update for our app that has this feature, but there are also great alternatives out there (see the checklist for information). The LEDs were designed to produce an apparent magnitude of 3 on a good pass, making them a little dimmer than the North Star. Here is a good list of the apparent magnitude of other objects to get a sense of EQUiSat’s brightness, but keep in mind it only lights up briefly. 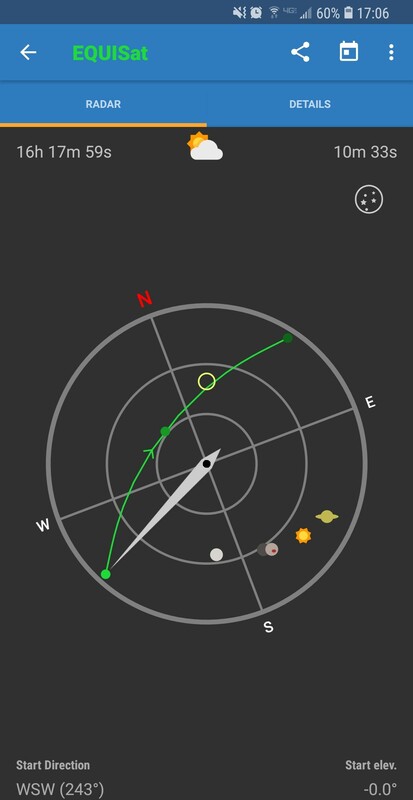 ISS Detector is a great app for tracking all kinds of satellites, including EQUiSat (not just the ISS). 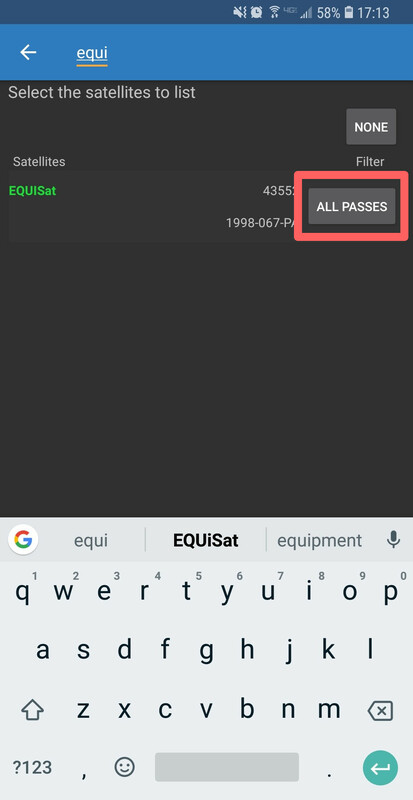 However, you need to select the “Amateur radio satellites” extension to view EQUiSat, and either watch an ad on Android and pay a dollar on iOS (check out Orbitrack for an iOS alternative). 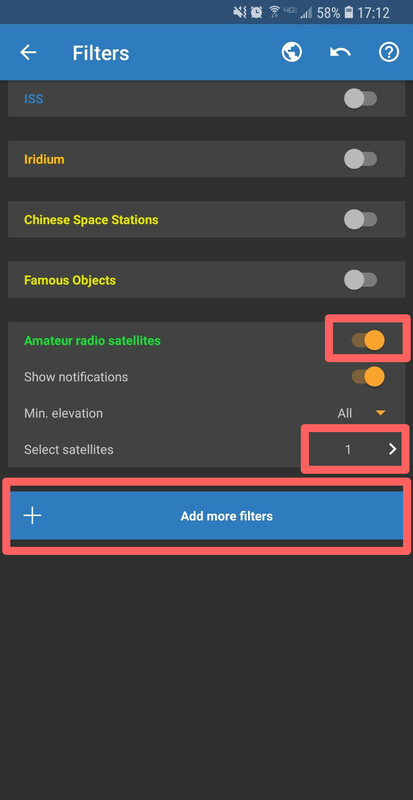 Step 2: click “Add more filters” at the bottom and add the “Amateur radio satellites” extension by watching an ad (click on “Free”) or buying it. Then, back in the filter screen you need to enable the extension and click on “Select satellites” to select EQUiSat. 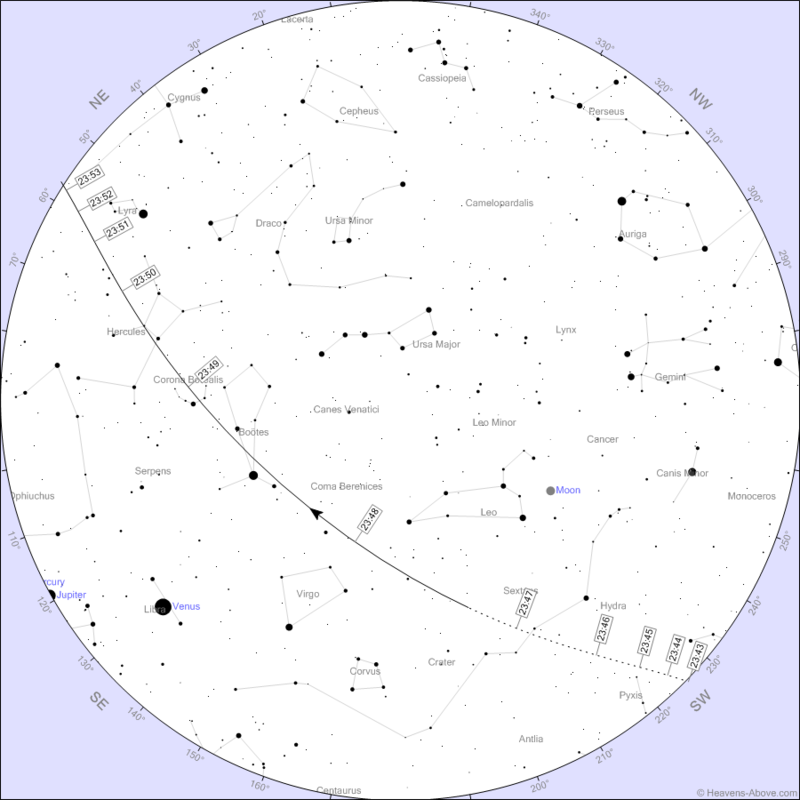 Once you have ISS Detector set up, you’ll see a list of EQUiSat’s passes. To see how ISS Detector tells you where to look, tap on one of these passes. You’ll see a “radar scope” and a yellow circle that moves as you move your phone. This “radar” actually represents the half dome of the sky above you, and the yellow circle corresponds to where your phone is pointing. You can also tilt your phone up above your head to see its position on a sky chart or even using your camera on iOS (see below). The green line in both views is the path that EQUiSat will take across the sky. When the satellite is overhead it will be represented by a yellow dot on this path. So, to know where the satellite is using ISS Detector, you just need to line up the yellow circle with the moving yellow dot that represents the satellite, and then look where your phone is pointed. During a pass, you don’t want to be staring at your phone, so it’s good to “take a bearing” once, stare at the sky for 30 seconds, and then look back and line it up again. 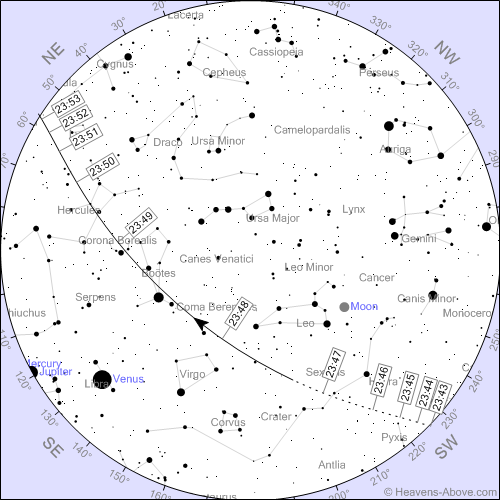 The satellite will move fastest when it’s just overhead, but that will also be the best time to see it, so make sure to keep looking up as much as possible! Note: the satellite’s attitude control system doesn’t appear to be functioning at 100% capacity, so despite what is described below you should have a chance to see EQUiSat anywhere where it passes overhead! 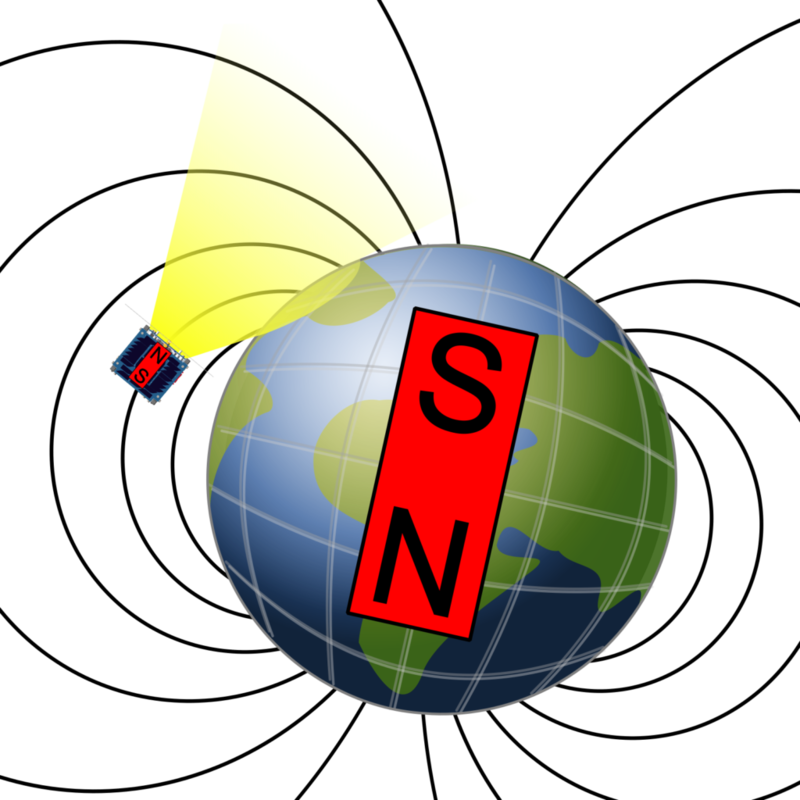 The satellite was designed to act like a magnet (it has a magnet inside it), such that its LEDs will point along the magnetic field lines of the earth, towards the magnetic North Pole. It points this way no matter what direction it is moving. Over most of the planet, these field lines are parallel to the earth’s surface, but as the satellite gets closer to the magnetic North Pole, these lines (and theoretically the LEDs) point down into the ground towards the earth’s core. This would mean that the closer you get to the magnetic North Pole, the better you’d be able to see EQUiSat, because it would be pointing more towards the ground. However, it would be visible even at low latitudes such as 10 degrees north. The fact that EQUiSat would face to the north also means that you would need to be north of it to see the LEDs. This would’ve meant that the best flashing oppurtunity would be when EQUiSat passed to the south of an observer. The map below shows the inclination of the earth’s magnetic field around the world. The angle given is the angle that one would’ve needed to be looking up at to see EQUiSat. This could be comapred to the “maximum elevation” of a southern pass to determine where to look to see a flash.